SUNRISE — In a battle of first-place teams Friday night at BB&T Center, the Florida Panthers, atop the Atlantic Division by a single point before the puck dropped, decided on an interesting approach in facing the defending Stanley Cup champion Chicago Blackhawks. They decided to get physical. “Let’s get physical” ala Olivia Newton-John. The “Pow!”, “Bam!” and “Zow!” of the old Batman series from the 1960s starring the incredibly great, talented Adam West. A 4-0 thorough whipping of Chicago later, spurred on by a pair of goals by the defense, 27 saves by Roberto Luongo, strong play on all four lines and a complete team effort, and the Florida Panthers (27-15-5) suddenly don’t look like the team that lost to a mediocre Edmonton club on Monday. Much of it came from the physical nature of Florida, who will never be mistaken for the punishing L.A. Kings, but who can bring the lumber and lay the wood when they need to. Such as defenseman Erik Gudbranson’s smash of Finnish forward Teuvo Teravainen in the second and oversleeping left winger Richard Panik in the third. 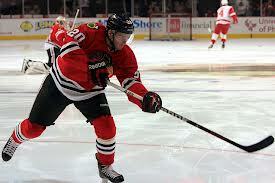 Plus Alex Petrovic’s bout with edgy Blackhawk Andrew Desjardins. Florida outhit and bruised the Blackhawks 27-18, including a game-high five each by Gudbranson and Petrovic. “Yeah, that (Gudranson hit) was a good hit, that was a good hit,” said Shawn Thornton, whose blind backhander in the third period nearly beat Chicago’s Scott Darling for a goal that would surely have brought the house down. After his post-game treatment, I caught Gudbranson, who ranked his hit right up there with his blow on Taylor Hall in Edmonton in terms of being his season’s best. As Teravainen entered the offensive end with the puck from the right side in front of Chicago’s bench, Gudbranson leveled the 5-foot-11 No. 86, who went head over heels covered in a swirl of curvy 8s and 6s on his white sweater. “That’s kind of what I mold my game after,” said Gudbranson when I made the reference to the Kings. “I really enjoy hitting, almost as much as scoring, and I haven’t done much of that. I make my name known that way. “The ref came up to me afterward and said it was absolutely textbook. I got him through the shoulders, and his head was down and I caught him off-guard. (That hit) or Hall right now. The Hall one was definitely harder. This one was a little more exciting to see him flying through the air. Even Luongo joined the fray in the second, roughing Desjardins after the Blackhawks’ left winger ventured into the crease following Luongo’s 14th save. 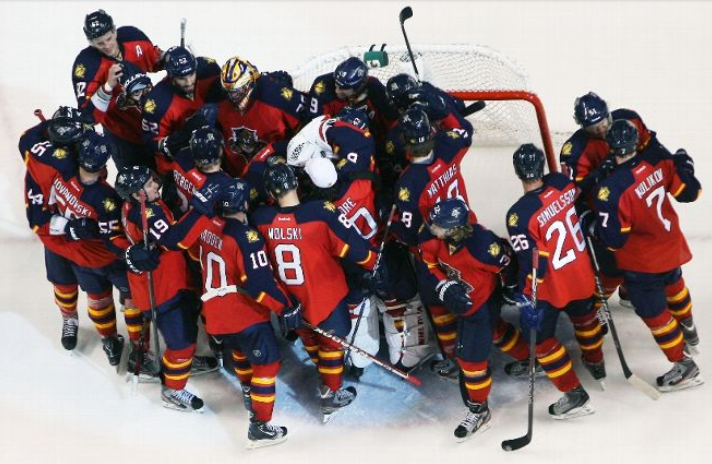 It’s a skill game at times, but on a night when Florida did almost everything right, was clearly by far the better team through 60 minutes and caught the champs on the second game of a back-to-back, the Panthers brought the hits and let the Blackhawks know they were there. SUNRISE – Wednesday morning – and perhaps it was really Monday night – could have been better for Florida Panthers forward Jimmy Hayes. Hayes, tied for fourth in team scoring with nine points, was one of the last Panthers to head off the ice at BB&T Center, strolling in hot and sweaty along with defenseman Colby Robak, as Florida wrapped up morning skate in preparation for its game against former Southeastern Division rival Carolina. The extra skating meant the pair would likely be scratched for the 7:30 game against the Hurricanes (6-11-3). Coach Gerard Gallant said Scottie Upshall (lower body) would likely be out “a week for sure” due to his hard hit into the boards Monday night. Upshall was wearing a walking boot Tuesday. Derek MacKenzie, who felt flu-like Tuesday, was expected to play. Gallant suggested Hayes’ potential scratch stemmed from effort. And when he’s not moving those feet anchoring his mammoth frame? 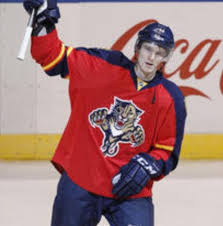 Hayes is tied with Brad Boyes in points (9) despite having played in only 13 of the 19 games for the Panthers (7-6-6). Jussi Jokinen leads with 12 points, followed by Nick Bjugstad and rookie Aaron Ekblad with 11 each. Hayes, originally drafted by Toronto, and teammate Dylan Olsen, were traded to Florida last Nov. 14 in a deal that sent Kris Versteeg back to Chicago. Hayes was playing in Rockford (AHL) at the time but saw the opportunity in Florida. “It was a new team and a chance to establish myself. I’m grateful and happy for that opportunity. I feel like I’m a full-time NHLer now and starting to contribute the way I want to. It’s good not to be the guy walking around on eggshells not sure where he’s going to be every day. I never say I’m complacent, but it’s good to have a role on an NHL team,” said Hayes, who missed six of Florida’s first eight games in October. The Boston College alum said he knows he has to play near the blue paint. “It’s where I’ve been my whole career being 6-foot-5, so I just had to take hold of (the spot) as a pro. Not many guys go there and stuff, so I was able to establish a spot there,” he said. Vincent Trocheck and Tomas Fleischmann, both scratched Monday, are expected to be in the lineup in place of Hayes and Upshall, while Olsen replaces Robak.